What documents are required for a Basic criminal record check? The documents required for a basic level criminal record check are listed below, with at least one confirming the applicants date of birth and one confirming the current address. As part of the process we will ask for three documents to ensure the minimum requirements are met. Please read this page for further information about which documents are accepted. If you have any questions about document requirements please contact one of the team on 0845 644 3298 or 0116 260 3055. 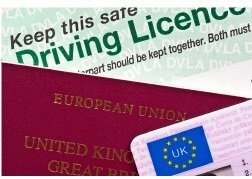 Please note that if you are applying as a non-EEA national you will be required to provide additional documents from Group 1a to activate your primary identity documents. If an applicant is unable to provide the correct combination or number of documents meeting the DBS requirements, they will be unable to apply for a basic level criminal record check. Below is a list of the documents that the DBS accept in support of a Basic Criminal Record Check application. The notes provide further guidance on the requirements for each document. Please read these carefully as some documents can change group or require supporting documents to validate them. For example a Birth Certificate issued within 12 months of the date of birth is a Group 1 document, if it issued after this it becomes a Group 2a document. Non EEA Bank or building society statement Valid only for roles whereby the applicant is living and working outside of the UK.